Yes, you heard me right. The meadow hat is finally done! This afternoon, after I finished sewing (you'll hear about that story next Friday, so stay tuned) I decided to knuckle down and finish the dang thing. It took me an hour and a half but I did it. I was knitting so quickly I was amazed that I didn't make any mistakes! You don't want to hear me yammer on about it, take a look for yourself! I'm now a happy bunny. And the best part is - She likes it! As you can tell, I'm pretty chuffed. Now I must decide what I will cast-on next, Mittens for my Mum or Zig-Zag Scarf for my Niece? Looks like I'm going to need your help! 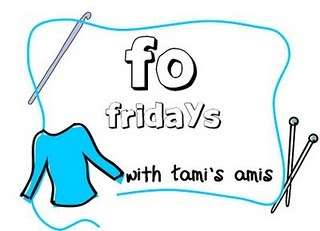 Before you pop off to check out the rest of today's Finished Objects over at Tami's, have a look at the new ABC Blogging meme I'm hosting, theres 16 of us taking part so far! YAY, I'm cheering for you here in San Diego. Great job. Of course she loves it, it's awesome! yay for an FO! I say do the mittens, mostly because I find that scarves are boring after a few repeats. Start the mittens, get one of them 3/4 done, then switch to the scarf! I love the hat! The colour is great and the texture looks like it would be great to wear. And there's something awesome about just sitting down for a marathon finishing session on a project, I think. Go you! That hat is awesome. I'm glad she liked it. And go with the Zig Zag scarf it sounds like fun.